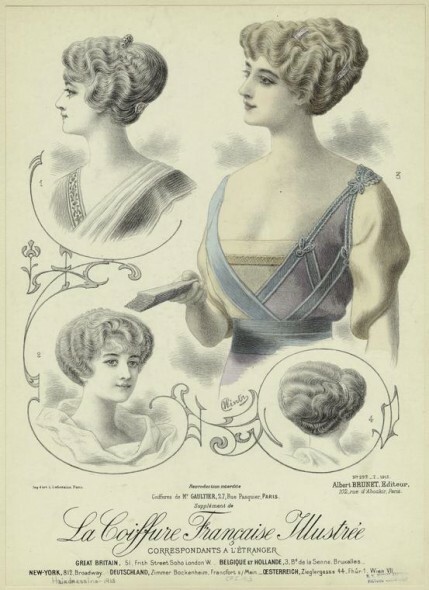 The coiffures of Katy Perry, Agyness Deyn, and Rihanna may spark some of today’s celeb and fashion-watchers to dye their hair various shades of blue, pink, and even gray, but the Edwardians were doing it long before them! For a brief period during 1914, the most daring leaders of Society and Fashion shocked the columnists of the day by adopting a trend created by Parisian hairdressers at the end of 1913 for the 1914 social season. These wigs were, of course, very expensive, as they were made of human hair–Chinese–and the tastemakers considered a wig to match each evening gown de rigueur. So outrageous was the trend considered, the more conservative members of London and Parisian society were loathe to admit any guests who showed up in a wig matching their gown. Oddly enough, by May, London socialites discarded their colored wigs for a new trend–their own gray hair! Now it was of the utmost mode to have a head full of gray hair dressed in the latest styles…perhaps a push back against the prominence of youth after Edward’s death? In any case, one can never discuss Edwardian style and fashion without mentioning Lady Duff Gordon of “Lucile,” and here is her article discussing the morals of pink and blue hair in the Omaha Daily Bee. This is so cool! Thank you for sharing it – I have a hankering to do a light blue wig in 1913 evening style now! “Mrs. George Keppel” was, of course, Alice Keppel, last ‘official’ mistress of Edward VII and great-grandmother of Camilla Shand, Duschess of Cornwall. I wish I had purple hair.